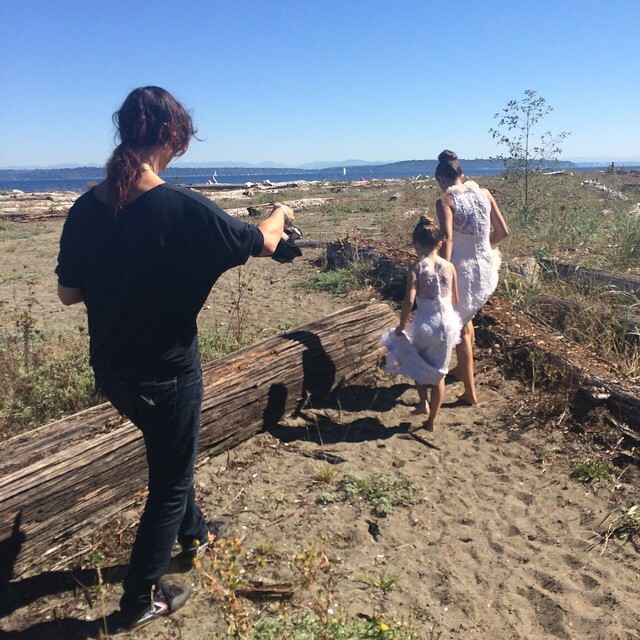 "HANDING DOWN THE BRIDAL TRADITION"
Ms. Lina Zeineddine and Ms. Victoria in "Handing Down The Bridal Tradition" on the beach at Fay Bainbridge Park, Bainbridge Island WA. “When will I be ready? ….. closes her eyes to a beautiful fantasy, filled with the genuine love of her mother, trusting… she drifts to the fantasy that will change the course of her dating life forever. Until days before finalizing THE BIG SHOW's text, this story was titled "Handing Down The Bridal Burden." As I am adamantly in love with love, this was a term of inner conflict.... as I do see the story as both of my intentions (as "Tradition" and as "Burden"). The thought was to be insightful to our undertones in life, not one of a gloomy demeanor. As a young girl, I, like so many others, enjoyed the fairytales of my animated princesses all with counterpart to complete their wildest adventures. The childish dreams of a future husbands raging about. As an adolescent, I may have drifted from my princess pals, but found them again in life as soon as I was unlocking the studio door, late at night, to my small (anxiety-ridden) dog.... The idea of a man to come in an save the day crossed my mind on more than one occasion... On my journey to be an individual, my largest struggle is to love myself. But in this struggle is actually a war... "Handing Down The Bridal Tradition" is a story of self-love, love of the individual, and therefore hopeful of true love.